Vidreres (Costa Brava). House for 24. 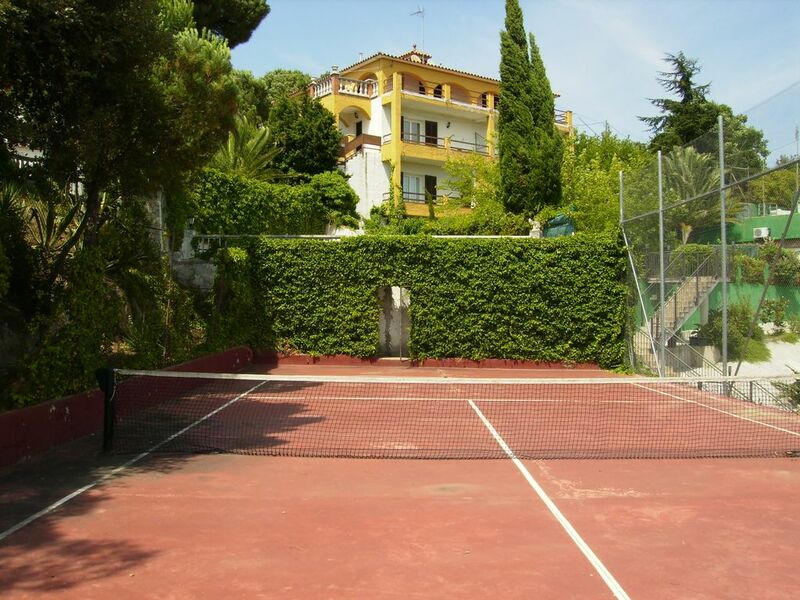 Garden, bbq., private pool and tennis. House for family or friends groups. Near the beach, in a quiet area. VILLA PIMA: located at 17411-VIDRERES, Urbanization Aiguaviva-Parc, Street Camelia, 13. Housing of tourist use registered with n º HUTG-001706. The property is a three story house with a usable area inside of 238,64 m2, for 24 people. The plot of land measures 1.500 m2. The dwelling is placed in a peaceful area with excellent views, 350 m. above the sea level. * Ground floor: Composed of 6 doubles rooms, 4 bathrooms, 2 independent kitchens (equipped each one of 2 fridges, stove with 4 burns, an oven, a dishwasher, a microwave, a toaster, several cooking tools; dining room (with TVC), covered balcony, with 2 laundries (each one with a washing machine, and an ironing board and an iron) and 2 terraces equipped with garden furniture and barbecue each one (one is covered). * Second floor: This floor is divided in two independent stays. Stay (1) composed one of 3 double rooms; 2 bathrooms; leaving-room equipped with TVC; and covered balcony. Stay (2) consisted of 3 double rooms; 2 complete bathrooms; leaving-room; and covered balcony. * Third floor: The object is not part of the rent. It consisting of a storage room of the ownership. It is not habitable. Access to this facility is not available to the tenant. The house has central heating (available from November to April), free internet WiFi and 2 cradle. * Swimming pool (5 x 10): fenced with secure access through door, for safety of children. Sun terrace with loungers. * Garden around the house. * 2 outdoor terraces: with table and benches. A tent with fixed. Available between November 1 and April 30. Schedule of functioning of 7:30 h. to 23:30 h. to a temperature of 21 º C, and of 16 º C between 23:30 h. and them 7:30 h.
1 set of sheets, quilt and blanket for bed. 1 set of hand towel and towel of shower for person.